For more information on eye nutrition, visit EyeNutrition.ca. After three unsuccessful strabismus surgeries, patient says no more. I’m from Coogee Beach which is a seaside suburb of Sydney, Australia. I am the father of Terry who has had two operations in his right eye to correct a squint. When those two operations failed, an unsuccessful operation on the good left eye to try to get binocular vision also failed. The surgeon proposed a 4th operation to which my wife and I hesitated. Terry still tilts his head to one side to avoid double vision since his eyes work separately. He failed the 3D vision test. Somehow I found the COVD blog and receive regular emails alerting me to new content. The blog has allowed me to consult with doctors who are members of it who have led me to a specialist vision optometrist at Maroubra Junction in Sydney very near to my home. Terry has been having regular vision therapy devised by Dr Liz Jackson and she has measured improvements from this therapy. I still follow the blog because of the interesting guest articles and because, from it, I found out about Dr Sue Barry who regained 3D vision in adulthood. So that gives me hope for Terry’s vision therapy being successful. The COVD blog has also alerted me to research which indicates that vision problems in young children is grossly overlooked (pardon the pun). As a result, we’ve had our youngest son Julian screened – so far so good but we will check his vision annually. Please keep this blog going for parents and practitioners for the good of patients like my son Terry! 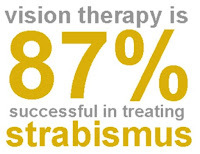 For more informaiton on strabismus, treatment for strabismus and vision therapy for strabismus, visit www.strabismus.ca. At our Vancouver optometry clinic one of the most professionally and personally rewarding things we do is to help children reach their full academic and intellectual potential by treating vision problems that interfere with learning. There are a number of vision problems that interfere with learning beyond the obvious one that can be fixed with glasses or contact lenses and need to be treated by a developmental optometrist using vision therapy. These include visual information processing and binocular vision disorders, convergence insufficiency and accomodative insufficiency. These disorders are sometimes the result of traumatic brain injury. That's because these are not problems with visual accuity,which means that even if a child has 20-20 vision as measured with the eye chart, the child's vision could be substantially deficient if she has one of these visual problems. Symptoms of some vision problems are a lot like ADHD - make sure your child is not misdiagnosed and unnecessarily medicated. 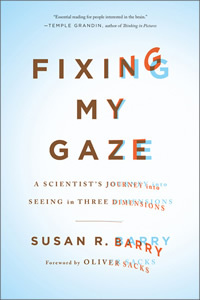 Fixing My Gaze is and inspirational book by neuroscientist, Susan Barry, who was born with strabismus (an eye turn) and had lived all her life without stereo vision, meaning that she could not see in three dimensions. She had three surgeries to "correct" the eye turn cosmetically but she still could not see properly and the eye was still turned, although less than before. She had lived this way for over 40 years until she met optometrist Dr.Theresa Ruggiero. Dr. Ruggiero treated Susan with vision therapy which corrected the eye turn and allowed her see in three dimensions for the first time in her life. Can you imagine how her world was transformed? Susan Barry's story is remarkable in that she was in midlife when she received vision therapy. The conventional wisdom, now being disproved by new studies, was that after a "critical period" around the age of 7 or 8 , the brain could not be trained (or "rewired") to see in new ways. The old scientific thinking was that after early childhood, the brain became fixed. In fact, Susan Barry herself and other scientists thought that it was impossible for her to ever see in 3D. Eye allergy, dry eye disease, virus or bacteria - which one is bothering my eyes? It is a scene that happens every day at our Vancouver eye clinic. A child comes in with dry eyes. Simple, right? Not at all! Here is a window on how doctors distinguish between dry eye disease, bacterial infections, viral infections and eye allergies. If a child has dry eyes, doctors have to find the cause. Dry eyes in kids can be caused by allergies, viruses, bacteria or systemic diseases. A good doctor will correctly determine the cause of the dryness in order to treat the problem effectively. Doctors distinguish between bacterial and viral infections on the one hand and allergies on the other using many techniques. One of them is by noting the duration of the episode. Viral and bacterial infections are usually not chronic. By contrast, a chronic problem can point to an eye allergy. Only about 1.5% of healthy children have dry eye disease symptoms and for most children dry eye is the symptom of an eye allergy. However, parents of children with dry eyes need to take them to the optometrist for evaluation because some symptoms point to potentially serious problems. For example, dry eyes with the presence of a symptom such as burning is an indication of possible systemic disease. In certain children with dry eyes, certain things point to dry eye syndrome such as a history of systemic disease like rheumatoid juvenile arthritis or Sjögren’s syndrome. Conversely, other things point to allergies such as a history of asthma or atopic dermatitis. Bacteria or a virus may be the cause of dry eyes if the child has a history of recent upper respiratory infection, or a recent eye infection in a sibling. To learn more about eye allergies in kids, click here. 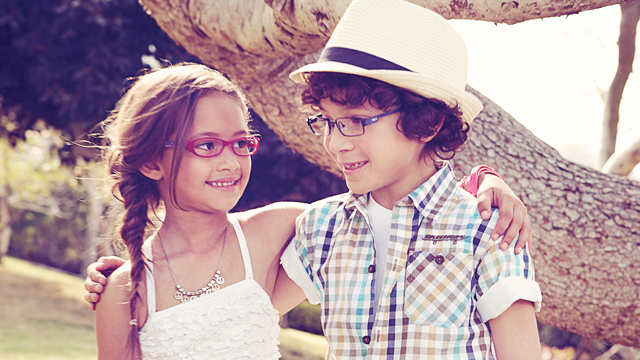 What is the best eyewear for kids? It's what eye doctors choose for their own kids. One of the most well known dry eye medications is Restasis which was created by and sold by the company Allergan. The active ingredient in Restasis is Cyclosporine. Eye-wear can totally change our entire look in addition to enhancing your vision, protecting your eyes from harmful UV radiation, preventing wrinkles and getting rid of visual fatigue and headaches and preventing skin cancer. What a great invention! 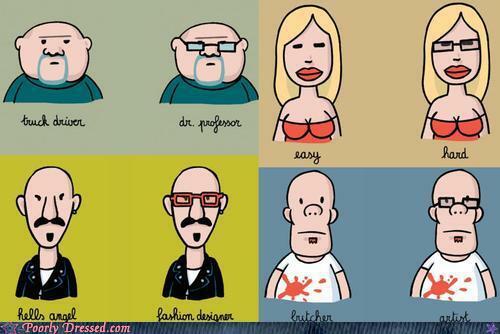 Visit www.freeglasses.ca to find out you you can get free eyeglasses from our Vancouver Optometry clinic. Brain injuries Brain injuries can result from impacts during sports, car accidents or falls and they can also result from events like a stroke, aneurysm or due to degenerative diseases that affect the brain. A brain injury caused by an external trauma to the head is called a “traumatic brain injury” or “TBI”. It is estimated that 20%-40% of people with brain injuries suffer vision related disorders. At our Vancouver developmental optometry clinic, we have treated patients with brain injuries resulting from car accidents, viral brain infections, sports related injuries such as concussions and more with vision therapy. In many brain injury cases, eye muscles or the nerves controlling the eye muscles are damaged, resulting in problems with teaming, movement and focusing of the eyes. These disorders include binocular vision problems, visual information processing disorders, convergence insufficiency and accomodative insufficiency. A number of published research studies support vision therapy as a and effective treatment for vision disorders caused by brain injuries. One study presented 4 cases of pediatric brain injury patients aged 6-18 years who were examined at an optometry clinic of a local hospital. The author found that the children suffered from a variety of ocular and visual disorders and three of them were having difficulties academically. Academic problems are no surprise since 80% of our learning happens through our visual system. The patients benefited from vision therapy. Brodak, M.I. Pediatric acquired brain injury. Optometry 2010 81: 516-527. DOWNLOAD. Green, W., Ciuffreda, K.L., et al. Accomodation in mild traumatic brain injury. Journal of Rehabilitation Research & Development. 2010. 47: 183-200. DOWNLOAD. Ciuffreda KJ, Ludlam DP, Kapoor N. Clinical oculomotor training in traumatic brain injury. Optom Vis Dev 2009;40(1):16-23. DOWNLOAD. Cockerham, G.C., Goodrich, G.L., et al. 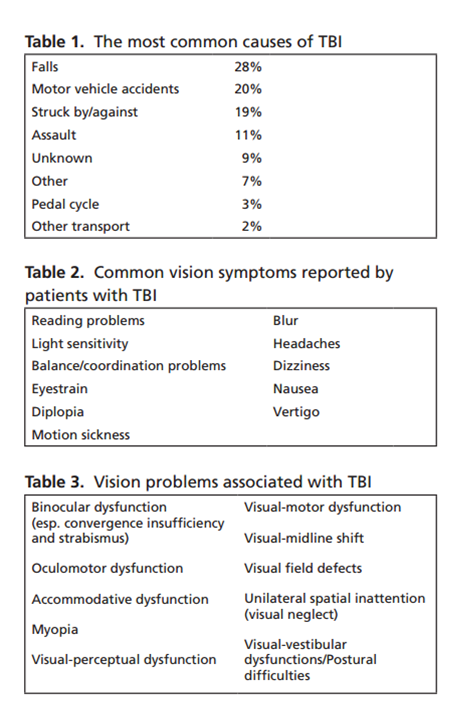 Eye and visual function in traumatic brain injury. Journal of Rehabilitation Research & Development. 2009. 46: 811-818. DOWNLOAD. Julie L., Julie, B-T, et al. Deficits in complex visual information processing after mild TBI: Electrophysiological markers and vocational outcome prognosis Brain Injury.March 2008; 22(3): 265–274. DOWNLOAD. Stanley, Paul. Effects of computer assisted visual scanning training on visual neglect: three case studies. Physical & Occupational Therapy in Geriatrics,1996 Vol. 14(2) 33-44. DOWNLOAD. Sharieff K. From braille to quilting: a neuro-optometric rehabilitation case report. Optom Vis Dev 2010;41(2):81-91. DOWNLOAD. Schlageter, K. Gray, B. Incidence and treatment of visual dysfunctoin in traumatic brin injury. Brain Injury. 1993, 7:439-448. Download. Brosseau-Lachaine, O. Gagnon, I. et al. Mild traumatic brain injury induces prolonged visual processing deficits in children. Brain Injury.August 2008; 22(9): 657–668. DOWNLOAD. Leslie S. Myopia and accommodative insufficiency associated with moderate head trauma. Opt Vis Dev 2009;40(1):25-31.DOWNLOAD. Gottlieb, D.D., Fuhr, A., et al. Neuro-optometric facilitation of vision recovery after acquired brain injury. NeuroRehabilitation. 1998. 11: 175-199. DOWNLOAD. Mandese M. Oculo-visual evaluation of the patient with traumatic brain injury. Optom Vis Dev. 2009;40(1):37-44. DOWNLOAD. Raymond, M.J., et al. Rehabilitation of visual processing deficits following brain injury. NeuroRehabilitation. 1996. 6: 229-240. DOWNLOAD. Proctor A. Traumatic brain injury and binasal occlusion. Optom Vis Dev 2009;40(1):45-50.DOWNLOAD. Tong D, Zink C. Vision dysfunctions secondary to motor vehicle accident: a case report. Optom Vis Dev 2010;41(3)158-168. DOWNLOAD. Tassinari JT. Vision Therapy for sensory fusion disruption syndrome: two case reports. Optom Vis Dev 2010;41(4):215-221.DOWNLOAD. Hellerstein L.F., Freed S., Maples, W.C., Vision profile of patients with mild brain injury. J Am Optom Assoc. 1995; 66: 634-39. DOWNLOAD. Freed, S. Hellerstein, LF, Visual electrodiagnostic findings in mild traumatic brain injury, Brain Injury. 1997, VOL. 11, NO. 1, 25-36. DOWNLOAD. Rowe, F. Visual perceptual consequences of stroke. Strabismus. 2009 Jan-Mar;17(1):24-8. DOWNLOAD. Han, E., The role of the neuro-rehabilitation optometrist. DOWNLOAD. Suchoff, I., Gianutosos, R., Rehabilitative optometric interventions for the adult with acquired brain injury. DOWNLOAD.